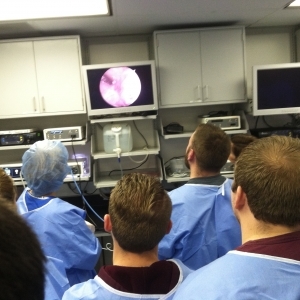 For the last four years, EKU's College of Health Sciences has hosted an Annual Scholar's Day. During this event, students from all of the college's departments gather to present research that was conducted throughout the last school year. This year the keynote address focused on Kentucky's opioid epidemic and was presented by a panel of professionals including a CDC Public Health Advisor, a medical coroner and an individual that that had suffered an active addiction and graduated from a recovery program. EKU's AT Program's Medical Director, Dr. Mary Lloyd Ireland, led 16 athletic training students, consisting of MS in AT and BS in AT students, through an exploratory wet lab including arthroscopy and an ACL revision. This opportunity was set up by Dr. Ireland as part of an in-service series to expand on our athletic training students' knowledge, experiences and networks. Dr. Ireland is an internationally renowned orthopedic surgeon and has served as the team physician for EKU in the past in addition to her current role as the program's Medical Director.